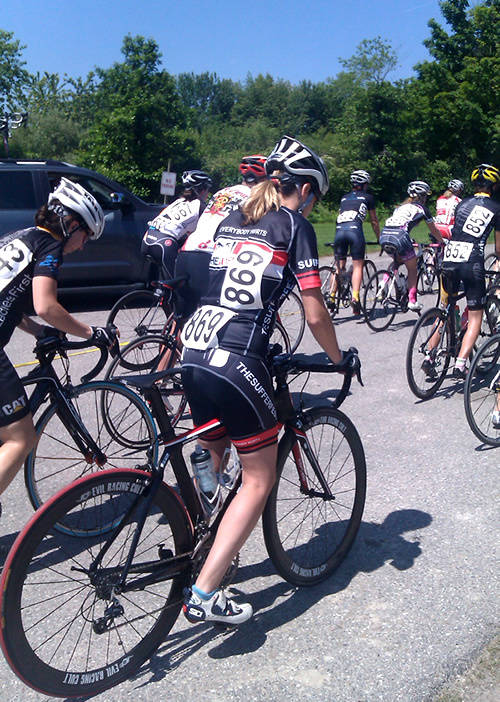 Elle: So it finally happened - my very first cycling race. I was reluctant to sign up, simply because I was totally scared. I had ridden the Purgatory route before, so I knew that it was tough. And I knew the field would be tough. But with Webb and Lenny (our cyclist buddy) putting the pressure on me to take the big step, I decided to face my fears and sign up. Webb planned on doing the race, but his field was sold out (and the wait list sold out too! ), so he acted as soigneur for the day. One thing that's nice about this race is that it is different than triathlons or running races, which start at the crack of dawn, in that, due to my category (the bike groups leave according to category), my race didn't start until 11:10am. Woohoo - no waking up at 4am to get to the race site for registration! This was a nice change indeed. And luckily Lenny's group left just 10 minutes before mine. Score. So Lenny picked us up at the late morning hour of 8:30am, and we headed out to Sutton for the big day. We arrived at the race site, went through registration, and set up for our warm up. Another thing that is different about a cycling race - a wicked big warm up session. Lenny and I had our bike trainers set up in the grass (more importantly, in the shade) to warm up for the race. Webb was great acting as coach, and led me through a 45-minute warm up, complete with sets of speed-ups and cadence work. I had on my headphones while Webb stood nearby giving me hand signals to let me know when to increase cadence, resistance, or both. I worked up quite the sweat. It formed a continuous stream from my forehead, down my nose, then oddly back up into my nostrils. Had it occurred to me to bring a towel? Of course not. Webb: I'll just add this series of thoughts: If you have never done a cycling race, it is an anxious affair for first timers and seasoned vets alike. Indeed you must race as a beginner a minimum number of times before you move up in categories simply to gain experience. (This also means the most frightening race is the beginners' race because most don't know what they are doing.) Most people have the fear of crashing or, more importantly, causing a massive pile-up. When you are riding in a pack with other cyclists at 15, 25 or 35 mph, it can get a bit tense. As such, a number of rules and protocols have developed over time to ensure safety. You can ask 20 cyclists for tips and receive 200 pieces of advice. At some point, you just have to get out there and race. Elle: So it was finally time for the race to start. I was full on nauseous. As I queued up with the other women, I couldn't help but notice that all of them seemed to be on teams. 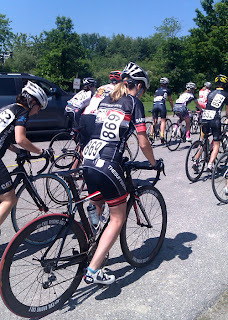 I couldn't pick out a lone jersey, they were all grouped up, chatting, clearly they had ridden in cycling races before. I sat alone. Luckily I had Webb there to give me words of encouragement, but I was scared out of my spandex, for sure. And then it started. There was a "neutral" start, so a lead car led the way to the actual start, which was over a mile away. It was supposed to be fairly easy, but the women were itching to go, and not necessarily at an easy pace. 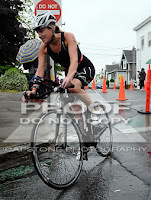 I stayed in the back of the peleton, not wanting to get caught up in anything. The race actually starts on a bit of a hill, about a 12% grade. But the peleton stayed together. A lot of the cyclists were chatting within their teams, I was just trying to hold my line and not do anything stupid. I was with the peleton about half way through the first lap, then a front group broke away, so I stayed with the back group, but they were going so slowly, that I found myself breaking away from them, and on my own. I eventually caught up with a small group, and we rode in a pace line for a bit, until that broke up. Webb: I thought this would be a good first race for Elle because it afforded her a lot of opportunities. She would get to ride in a peloton. The hills would likely break it apart, so if she was dropped she would probably get to do some pace-line work with a chase group. Even if she ended up riding alone, it would be valuable to her as a time-trialing triathlete. I absolutely envied watching Elle and Lenny race at Purgatory. I did the race 2 years ago and have ridden it several times since. Knowing the race and the course, I know Elle did a fantastic job. She didn't get down. She soloed and she worked with others. She had the complete experience. I wish I had been able to get better photos of her. The best photo of the day had to be Lenny letting me know how his day was going. Elle: There were some supportive spectators at key points on the course, especially at the top of the big hill. After one of the laps, someone shouted out, "Great job, you just got to the top of a beast of a hill!" I wanted to laugh, but I didn't have any oxygen to spare. I thought, "Yes, this is a really tough, tough hill. But it's no Beast!" Out of 50 women in my category, I was one of only 5 women not on a team. And I placed #38.